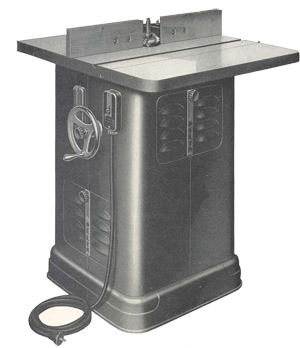 The Delta 43-205 Heavy Duty Shaper was a main stay in many woodworking shops. Ideal for the cabinet shop, furniture factory, speicalty shop, sash and door company -- as a matter of fact, any shop where accurate production shaping must be done at low cost. The table is a big 27" x 28" and can be increased to 27" x 36" by adding the extension table. Big and husky spindle is 3/4" x 3-1/4" under the nut with a full 3" travel. Carried on sealed, Lubrictated-for-life ball bearings. Spindle is accurately ground-- bearing seats deamond bored for absolute accuracy. Standard 3/4" spindle eaasily and quickly interchanged with 1/2" or 5?16" spindles for 3 lip formed cutters or with 1/2" stup spindle or cope cutters. Main bearing housing is massive and is supported by a 3 point suspension which keeps spindle square with table. Removable table inserts in three sizes provide capacity for solid cutting tools up to 6" in diameter and sectional and inserted cutters up to 4" in diameter. Safety and convenience are retained. Controls are conveniently grouped at front spindle height indicator covers full 3: travel. Knob in center of hand wheel locks position. Each half of fence is fully admustable independet of other half, a good safety feature. Steel cabinet fully encoloses motor and working mechanism. Doors provide easy access for repairs or replacement. Easily cleanred. Heavy enought to stay put yet light enough to be moved to facilitate production. No. 43-205 - Shaper with No. 1354 Fence, 3/4" Spindle, Table Inserts, Starting Pin, Wrenches, Spindle Pulley, two No. 1349 Table Extensions, No. 287 V-Belt and No. 5710 Motor Puley. Without motor, Reversing Switch or cutters. 340 lbs. No. 1340 Shaper with No. 1354 Fence, 3/4" Spindle, Table Inserts, Starting Pin, Wrenches, Spindle Pulley, one No. 1349 Table Extension, No. 287 V-belt and No. 5710 Motor Pulley. Without Motor, Reversing Switch or cutters. 297 lbs. No. 287 - V-Belt. Outer Circumference 30"
No. 865 - Clamp attachment for miter gage, with clamp bar, two sliding clamp screws, adn front and rear posts. No. 1349 - Extension table, 8" x 27"
No. 5710 - 7-1/2" Motor Pulley for 3450 r.p.m. motors. No. 43-826 - Solid Shaper Spindle Cartridge Assembly with 3/4 x 10 R.H. Thruead for use on No. 1340 or No. 43-205 Shaper where only clockwise rotation of spindle is desired. This spindle cannot be reversed for counterclockwise rotation.